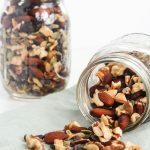 With the holiday coming up, I wanted to share this Heart Healthy Trail Mix that is a great low sodium summer snack. As some of you know from reading my post about my dad’s health scare, my parents have become more conscious about the sodium in their diets. The average amount of salt an adult consumes each day is around 3,400mg. The American Heart Association recommends an ideal limit of no more than 1,500mg per day. Most of the pre-made trail mixes have a ton of added salt, sugar and preservatives in them that to me is no-bueno. In my personal experience, I used to love salt. After realizing how much it affects our cardiovascular system and water retention in our bodies, I decided to cut back. I went through a couple weeks where I was craving salty things because my pallet was used to it. However, after I got past the initial month or so, I tried a salted pretzel and holy moly was it SAL-TY. My palate almost ‘reset’ itself to recognize how much sodium is in food again. Where I work, I see this almost every day. Some people may think the hospital food is too salty, where others think it’s bland. Lifestyle and what you are used to plays a huge role. This is my challenge for you. Look at the food you or your family eats, is it too salty? Do you use table salt? Try cutting back for a 2 weeks and see how you feel, see how it effects your palate and your waistline. 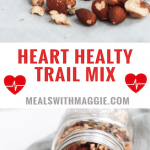 This Heart Healthy Trail Mix can be easily portioned out into fifteen servings. It contains no sodium and the only sugars are natural that come from the fruit and no preservatives. Nothing gives me more satisfaction of when I look at a food label and see ingredients I can pronounce and that I’m familiar with. Almonds, walnuts and pecans : Its no surprise these nuts are high in antioxidants and have cholesterol-lowering effects on the body. In this study, subjects who ate nuts at least 4x a week showed a 37% reduced risk of coronary heart disease compared to those who never eat nuts. Each additional serving of nuts per week was associated with a 8% reduced risk of coronary heart disease. Pepitas: Aka pumpkin seeds. These little guys are full of minerals phosphorus and magnesium. They are also a good source of zinc and iron. Dried cherries: A powerful antioxidant. 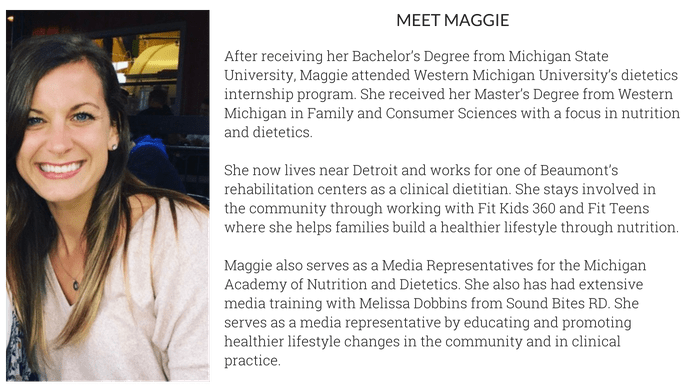 I once had a presentation from the registered dietitian for the Red Wings and she said that they all drink cherry extract after each game to help repair any damage done to their tissues/muscles during the game. Dried apples: Make sure to look for dried fruit without sugar added! Dried apples provide a nice taste while giving an extra kick of fiber. Mini dark chocolate chips: lower in sugar and higher in antioxidants than any other chocolate. I like to use mini because then you know you will get a little piece of chocolate in every bite. 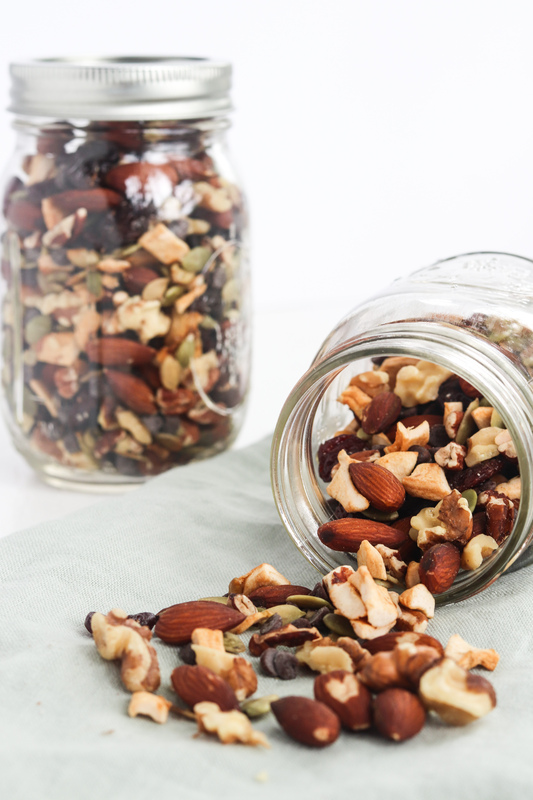 Nothing beats making a batch of trail mix, throwing it in the car and hitting the road. 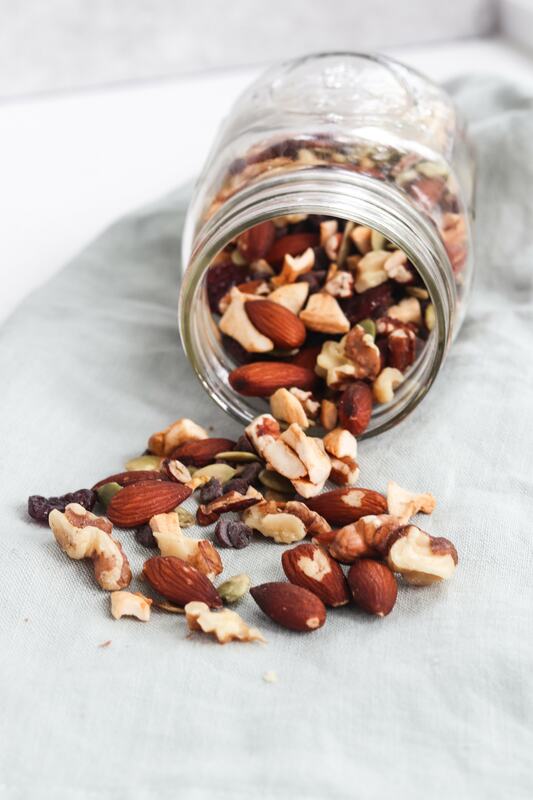 Trail mix also makes for a great pick-me-up that satisfies that afternoon craving for sweet and satisfying. 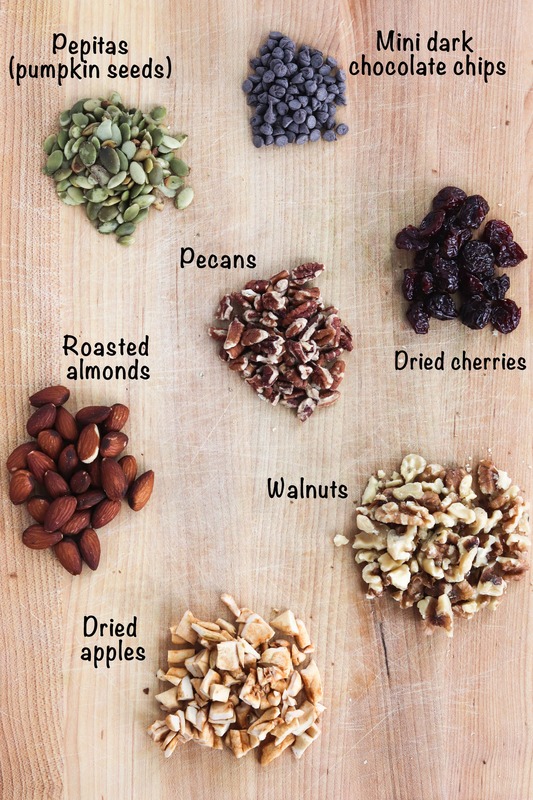 How many of you like trail mix? What’s your favorite mixture? I want to know, share below! 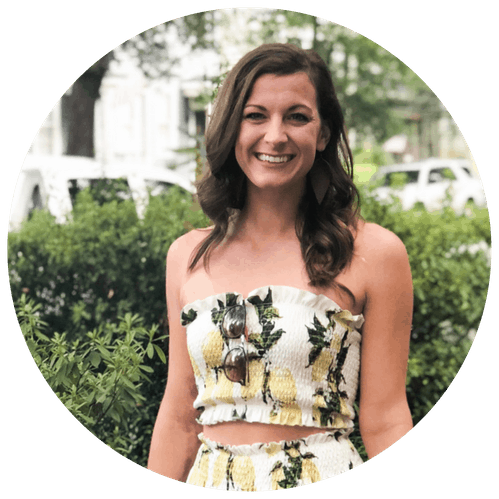 Don’t forget to ‘Pin it’ for later and follow Meals with Maggie on Pinterest! Store in airtight container. Mason jars work well or individually bag them for pre-portioned out snacks for on-the-go. If you wanted to roast your almonds- place on single layer baking sheet and cook at 350 for 5 minutes. Remove- stir them around then place back in the oven for about 3 minutes. Be careful- they can burn very easily.